With the felicitation ceremony of Scouts-Guides K.R. 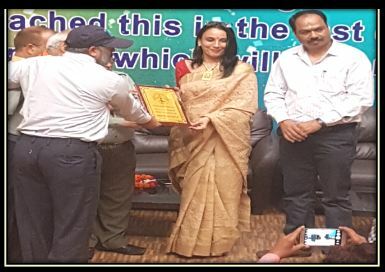 Mangalam World School, Vikaspuri added another feather in its illustrious cap. History was created today as 470 students of the institution were felicitated with National Level Certificates of excellence and participation. KRM, Vikaspuri organized a ceremony to honour and felicitate the Scout-Guides who have participated in the Hindustan Scouts and Guides Programme. The Chief guests for the occasion were Sri. Rajesh Solanki, President -Indian Games Federation, Sri Srinivas Sharma ji founder Chairman Hindustan Scouts and Guides, Sri Ravinder Talwar Senior Trainer at Hindustan Scouts and Guides, Dr. Piyush Jain, Secretary Physical Education Foundation of India, Grandmaster Abhay Karan, President Sports Association, India. The eminent gathering was very pleased with the initiative taken by the worthy Principal, of KRM Vikaspuri Mrs. Meenu Kanwar. The Scouts and Guides Programme has motivated students to lead a disciplined life. They have pledged to devote their life towards bringing about an awakening amongst the citizens of their motherland.